INDUSTRY.co.id - Jakarta - Minister of Energy and Mineral Resources (EMR) Ignasius Jonan confirmed the development of refinery development master plan (RDMP) in Balikpapan, East Kalimantan will continue to run on target. "The development of the refinery has become a commitment of Jokowi Government and must be implemented," said Jonan on the sidelines of the inauguration of the Jangkrik Field gas production facility in Handil Baru Village, Samboja District, Kutai Kartanegara Regency, East Kalimantan on Tuesday (31/102017) as stated in his statement at Jakarta, Wednesday (11/01/2017) That, according to him, is a commitment Jokowi-Jusuf Kalla Government in implementing Nawacita sector of ESDM. The Balikpapan RDMP project will be undertaken by PT Pertamina (Persero) in two phases which will be completed by June 2021 or 22 months sooner than targeted. The first phase is completed in 2019 and the second phase in 2021. The Balikpapan RDMP development is estimated to require 4.6 billion US dollars of funding. According to Jonan, Balikpapan Refinery current production capacity of 260,000 barrels per day will increase to 360,000 barrels per day after modification. 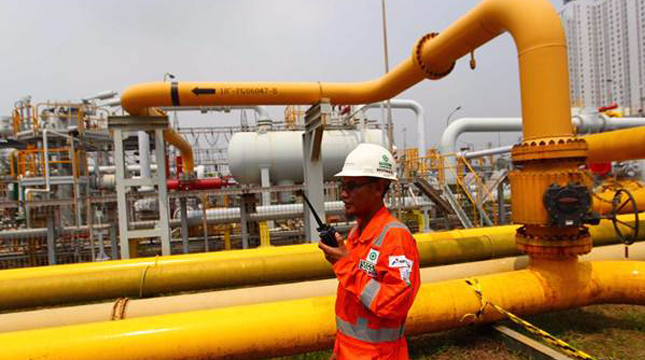 "This is a five billion dollar project from 260 thousand barrels per day to 360,000 per day," Pertamina said, adding that Pertamina would run it. Jonan has even written to President Jokowi to do the ground breaking of the Balikpapan RDMP project. "We have just sent a letter to the President for the proposed development of the Balikpapan Refinery, and we hope that the President will symbolically review or 'ground breaking', hopefully Mr. Jokowi is pleased here (Kaltim)," he said. The project's work, Jonan added, will begin six months from now and oil refinery products will be upgraded to meet Euro 5 specifications from the previous Euro 2. "I think starting the work can be six months from now including Bontang, Tuban and Cilacap," he said.